And by the time I walked out those doors as a full-time coach, I had cut my teeth really well on coaching story. How to write and tell one so that it MOVES your audience. I couldn’t help but think about some of the big rookies mistakes that speakers make when they’re working on their stories. 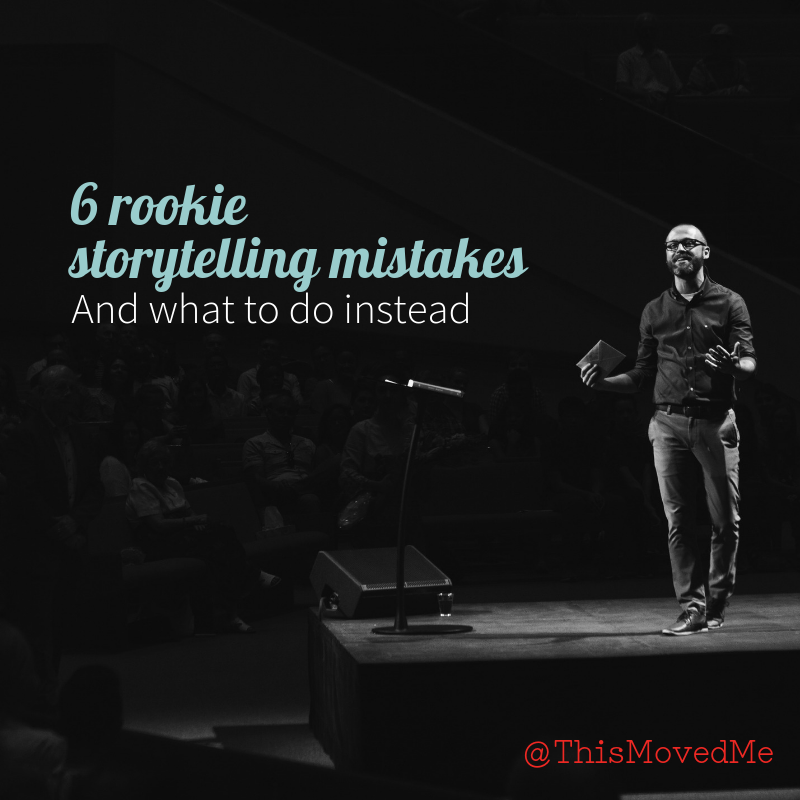 So here they are: The 6 biggest rookie storytelling mistakes… so you won’t make them, too! Most people when asked to tell a story, actually end up telling us ABOUT something, rather than just bringing us into a moment. It seems like a no-duh shift, but I can’t tell you how often I’m shifting people away from summarizing a moment that happened instead of BRINGING ME INTO THE MOMENT, AS IF IT’S HAPPENING NOW. Storytelling isn’t a summary of what happened. … or an anecdote…. Storytelling is a specific moment in time. Just tell us the story. It’s more engaging. Interesting. Artistic, even? Mistake #3: Not making it specific enough. But when you home in on a MOMENT, THAT’s when you want to get VERY specific, and think about keeping it visual. As audience members, we need to SEE it in our heads if you want us to remember it. It’s like it pauses it in a moment of time, and snaps a PICTURE. When you can make that imaginative connection, your audience is much more likely to remember it. For more on the neuroscience behind visual specificity and how it impacts our audience's memory, listen to This Moved Me Episode 187 with Neuroscientist and Speaker Carmen Simon. When we home into the moment we are bringing to life, we want to get specific. But the general arc and flow of a story need to be as simple as possible. Too many characters, too many places, we end up losing the point (and then losing the audience). Listen to my VERY FIRST PODCAST episode (Episode 001! ), with the brilliant Rita Boersma, all about Story Truth. But one of the best ways to make it EMOTIVE is to make it FEEL present tense. 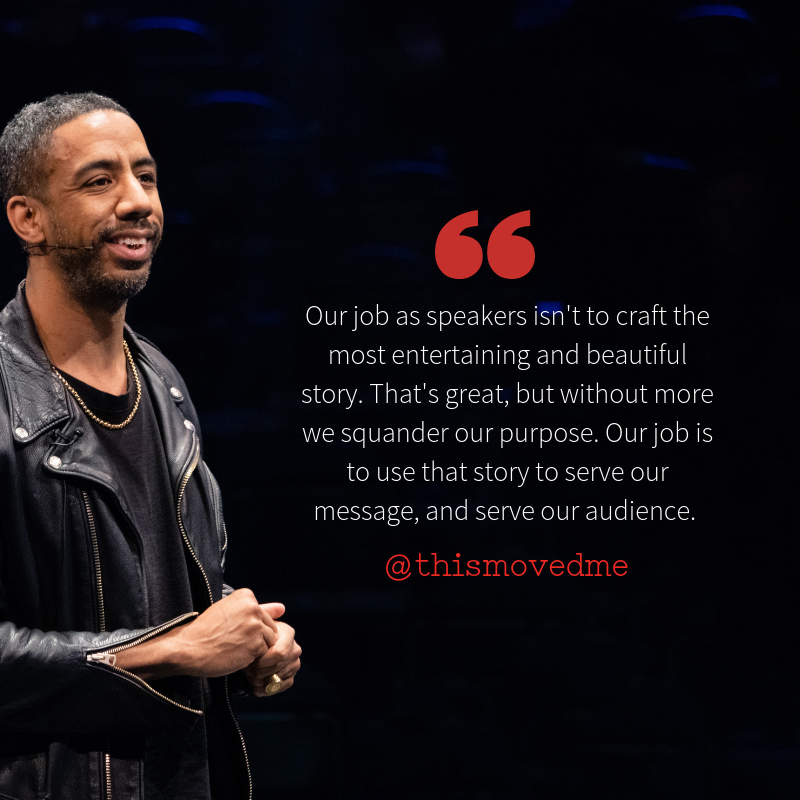 Make it feel like it is happening again… the words of the speaker meld with the brains of the audience - and it actually IS like it’s happening again. The powerful Mirror Neuron ignites, and EMPATHY hits. And many speakers miss out on the simplest way to shift it into feeling NOW, versus happening in some distant past… and that is playing with past and present tenses. When a “character" speaks… you simply shift into present tense. Try it - it will level-up the emotive power, I promise. And I know that’s why you’re here. And I’m here to help you step into those moments with more confidence and clarity! And to avoid these rookie storytelling mistakes! We get all meta on what a story is… and isn’t. Essential reminders for us as speakers and leaders. Get on the SPEAKING STORIES waitlist!